I have been meaning to try my hand at borscht for awhile on Soupy but for reason I haven't gotten around to it until this week. I didn't know that much about the soup - except that it was a Russian soup that included beets. When I read more about it, I learned that borscht (or bortsch, borstch, borsh, barszcz, and borshc) is a regional cuisine from Central and Eastern Europe, that depending on the country, can be served hot or cold and whose ingredients vary just as much as how the soup is pronounced. For example, hot borscht (generally from Poland) is made with beets, potatoes, celery, and even bacon while the cold borscht may have tomatoes, cucumbers, and cream. There are also borscht recipes that include meat and mushrooms and those that have cabbage and buttermilk. Since the temps are dropping, I decided to try a hot borscht and based my recipe on ideas and some ingredients from "The Soup Bible " and "Simply Recipes." Sort of a fusion of the two, my borscht was pureed but also had chucks of beets that resulted in a delicious and sweet soup. Since there are so many possibilities, I look forward to trying another type of borscht very soon, until then enjoy! Soup 101: What is Stock, Bouillon, and Broth? Since I've started Soupy, I've been learning so many new things about soup through experimenting with new recipes and ingredients. I learned how to make my own stock and use different flavorings (see Project Food Blog post on using feungreek and cardamom pods) and to trust myself and create new soups. I realized, though, that Soupy is lacking an All About Soup Section -- to read about and discuss the basics of soup techniques, soups preparation, ingredients, etc. Since I am still learning myself, I'll call this section Soupy 101 and as I continue to learn it will be expand to hopefully be a comprehensive glossary of soup terms. For now, here's a brief lesson on bouillon, stock, and broth and be sure to check out Soupy next week when I talk about the differences between stew, soup, bisque, and chowder. Until then...study up! First of all, a BIG thank you to everyone that voted and showed me some serious soupy support in the first challenge. I'm really excited to move on in the competition, and none of that would have be possible without your votes! Now on to the second challenge.... that might be better titled, "Am I really making a Malaysian Mutton Soup?" As a part of the second challenge, contestants were asked to tackle a classic dish from another culture that is outside of our comfort zone -- while keeping the dish as authentic as possible. I immediately knew that the only challenging/out-of-my-comfort zone food that would make sense for me would be to cook some sort of meat. You see, for the most part, I don't really eat meat -- but sometimes I do. Confused yet? I have been a vegetarian on and off throughout my life; the times that I have eaten meat haven't been anything too crazy - maybe trying someones dish at a restaurant or in a sandwich. The times that I have I prepared it myself, it was something simple, like a baked chicken or meatballs. Cooking meat is something that doesn't come naturally to me, so I never really learned how to prepare, cut, or flavor it. BUT this blog isn't about what I eat. Plain and simple, I want it to be about soups -- ranging from meat to vegetable and everything in between (wait, what's between a meat and vegetable anyway...). You get my point. I want it to be about me trying new soup recipes -- specifically those that I never would have tried before. It's about the experience of trying something new and outside of my comfort zone -- much of which can be uncomfortable and unfamiliar. The idea is that, there are all of these amazing ingredients and various types of soups from different cultures that I never would have tried if it wasn't for Seriously Soupy. So, not only am I getting outside of my comfort zone for the Food Buzz challenge, but this new recipe is helping me push myself as I learn more about a new soup (mutton) and a new culture (Malaysia) to be more adventurous with Seriously Soupy. Instantly, I thought of lamb for this challenge. Again, I never cooked with it, so it would be 100% new to me - the cooking, flavoring, and how to cut it. I decided to go with Malaysia as my country when I was struck by a mutton soup recipe - that was different to me for a lot of reasons. First, I have never (at least not to my knowledge) eaten nor prepared a Malaysian soup. As I learned more about Malay food, I was excited to try to make a soup that according to MalaysianFood.Net, "comes into its own late at night, when its valued for its restorative qualities." It was also interesting to learn that Malaysian food is strongly influenced by its neighboring areas and Hindu Indian fare. Typical cuisine includes beef randang (spiced coconut beef), laksa (tangy fish soup), and sup kambing (mutton soup). Do I get a prize for cutting this? Secondly, I would be using new spices and herbs that I have never heard of or cooked with like fenugreek and cardamom pods. I was immediately struck by how aromatic and fragrant these herbs were. As I was cooking, I was shocked by the smells. In this whole year of making soups, my kitchen never smelled this amazing and vibrant. I've been so accustomed to using key ingredients and herbs - mainly olive oil, garlic basil, oregano, etc that I have been cooking one way without even realizing it. Even the simple act of smashing the caradaomon pods was invigorating to me as I was cooking in uncharted territory and learning how to use this new flavoring. Cooking with fenugreek - who knew! Another new soup-making skill that I learned was how to make paste. The combination of onions, garlic, ginger, cloves, cinnamon and chili peppers taught me a new way to blend ingredients together and flavor soup. A way to flavor without having chunks of onions and garlic was so simple but I never thought to try. Then, it was time for the lamb. It was strange to chop and dice the meat into small squares - I felt self conscious and awkward, not to mention bothered by the smell. All I kept thinking was, "Am I really doing this?" I wasn't sure it I didn't like it or I didn't like because I didn't really know what I was doing. As I placed the lamb in the pot, it felt strange to have completed something that I never really would have tried before. In a lot of ways it changed the way I will view soup and, to me, was exciting to try something so foreign and adventurous to me. As the second challenge ends, I not only know a little bit more about Malaysian food, but I understand a new method of soup preparation, new spices, and now how to cook with meat -- an eye-opening experience that allowed feels refreshing and scary at the same time. Refreshing because it wasn't as hard as I thought it would be and scary because I have no more excuses not to try soups that I am not familiar with. 2 tablespoons of peanut oil, approx. 1. The paste - Mince the ginger, garlic and cut up the onion and place it in a blender, along with the peppercorns (or pepper), cloves, cinnamon, bay leaves and chili powder. Mash together and place in a blender to make a paste. This step took a little getting used -- since dry ingredients were involved but placing my blender on liquefy. 2. Add peanut oil to a wok and let cook on a low flame with cumin, fenugreek, sugar, and the paste. Cut up the shallots and add, stirring periodically. 3. Cut up the lamb into small pieces and add them to pan, along with the bone (to enhance flavors). Cut up the tomatoes and add them, along with the tomato paste, bunch of cilantro, and cinnamon. Smash up the caradamon pods (I used the peanut oil canister) and add them to pot. Let the meat cook on both sides. 4. Add water and bring to a boil, reduce the heat to a very low flame and cover. Let the soup cook for one hour. 5. During the hour, taste and add any additional ingredients - I added some more ginger, a bay leaf, cinnamon and salt. Also, stir, stir, stir. 6. Top with cilranto and serve with rice or crusty bread. 7. Breathe - You did it! Again, thanks to everyone who supported and voted for me in the First Challenge. Let's continue the soupy momentum. Voting for the Second Challenge starts on September, 27th and ends on September, 30th. Think Soupy for Project Food Blog! My hummus soup recipe has been an all-time favorite recipe on Soupy (and of mine) that even managed to make its way to the first page of Google -- whoo hoo! Since much has changed about the site and the ingredients I use, I thought it was time to update this recipe as the second soup as a part of the "one recipe, three soup series." For the first installation, I made three different cantaloupe soups where I used one basic ingredient (cantaloupe) and modified each recipe with its own distinct flavors and ingredients --- resulting in a green tea melon soup, a mixed berry soup and a prosciutto and melon soup. Hummus soup is also the perfect base for three different types of soups where you can easily add or take out a few ingredients to create a completely different recipe. So, hummus soup doesn't have to just be chickpeas and tahini -- you can add white beans or maybe lamb or couscous -- or in the case of this post, roasted peppers, eggplant and olives, and turkey. All very different soups that use the same basic components: chickpeas, tahini, lemon juice, and garlic. I hope you enjoy this series and I would love to hear what ingredient you would like to see featured next month. Remember, no matter what I suggest here you can also use it as a base and add/take out whatever you want. There are no rules with soup. Soupy Note: I changed the hummus soup (a bit) from the original recipe and the measurements are tripled to make three soups, well four, including the actual hummus one. 2-4 tablespoons of olive oil, approx. Place water into a medium-sized pot. Chop up the garlic and add it to the pot, cover, and let boil for 10-15 minutes. Add the chickpeas and tahini, along with the salt, pepper, cumin, curry, cinnamon, and tumeric and let cook for another 20 minutes. 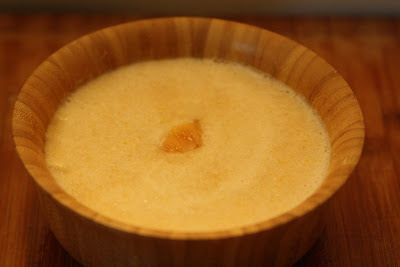 Turn off the flame and blend (either with a hand blender or regular one). Top off with various seasonings and a drizzle of tahini for a garnish. Pre-heat the oven to 350 degrees. Cut up red peppers and the garlic and place them on a baking tray or aluminum foil. Drizzle with olive oil and tahini (use your discretion) and add the salt, pepper and ground cloves. Let cook for 30-40 minutes. When soft, remove from oven and add half of the peppers into a blender, along with two cups of blended hummus soup. When blended, place into a bowl and mix with the chunks of red pepper. for a semi-chunky and delicious soup. Enjoy! hummus soup (broth and whole chickpeas) -- don't blend. Add olive oil, scallions and garlic to a frying pan, along with ginger and red pepper flakes. Let cook for a minute or so and add the ground turkey. Add the tahini, salt and pepper and cook - checking on the turkey periodically. Turn off the flame and add the turkey to a bowl. Pour the broth from the hummus soup and chickpeas into a bowl -- since this is a chunky stew, I didn't blend the hummus. Chop up the eggplant and remove the pit from the olives and let marinate for 30 minutes in olive oil and lemon juice. When ready to cook, add olive oil to a pan and chop up the garlic and sage and saute on a low heat. Add the eggplant and olives, along with the cinnamon, salt, pepper and garlic salt. Let soften (about 20 minutes) and turn off the flame. Let cool and add the eggplant and olive mixture to a blender, along with the hummus soup. Liquefy and pour into a bowl. This recipe is pretty thick, so add more water for a smoother soup. Tea and Soup Recipes and a Tea Contest! Tea and Soup. Some may say that they are an unlikely pairing, but I think they make perfect sense together. Tea, on one hand, is a comforting beverage that soothes the soul -- just like soup does. 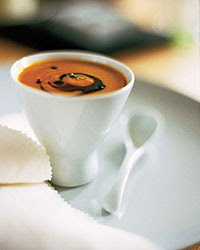 Soup comes in all types of recipes -- which are all unique, but tasty -- same with tea and their various varietals and methods of preparation. Tea is healthy and believed to contain powerful antioxidants as is soup (when used with the nutritional ingredients). 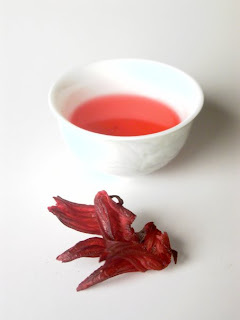 What I think is the most exciting (and a different way to cook) is that the flavoring in tea also works really well as an ingredient in soup -- both to compliment and enhance. The folks over at Sanctuary T, a tea restaurant in Soho are obviously huge tea fans and are currently running a tea-inspired recipe contest until September 30th. All participants have to do is fill out a quick entry form with their tea recipe -- and this doesn't have to be a soup and tea recipe, but can be anything with tea -- tea cakes, tea pudding, tea rice, tea vegetables...you get my point. The grand winner will receive a $50 gift certificate to Sanctuary T Shop and have their winning recipe featured on the Shop's website. The runner-up will win a free bottle of T-Dust Seasoning and a 2 oz. tin of tea of their choice. Whether you have a tea soup or another recipe that uses soup, you should enter! For official contest form, visit: http://www.shopsanctuaryt.com/recipecontest. 1. Peach Soup - I can't think of a better way to enjoy the last days of summer than with a tea-infused peach soup. This recipe, from Epicurious, is not your typical peach soup, but I like that it uses white and yellow peaches, ice cream, and of course peach tea for a semi-healthy dessert-like soup. 2. Sakura Tea Soup - This has to be one of the most unique soups that I have ever seen. 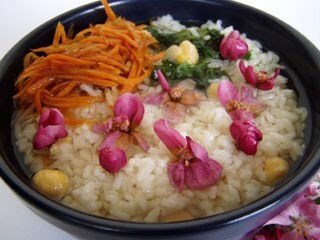 A native Thai recipe by Appon's Thai Food, this tea soup includes sakura (Japanese Cherry Blossoms) -- whose purpose is mainly for display -- carrots, pickled radishes and beans that is topped off with hot green tea. After this, the flowers open and a beautiful soup is ready to be consumed. 3. Shiitake Mushroom and Green Tea Soup -Green tea is quite the popular ingredient in soup - perhaps for its high dose of antioxidants and earthy-like taste. This recipe, by Herbs for Life, uses the equally earthy shiitake mushrooms, noodles, kombu (dried kelp) and onions. Herbs for Life also notes that green tea, shiitake mushrooms and seaweed are believed to fight certain cancers. While I can't verify that, eating a soup like this can definitely be a part of a healthy diet. 4. Tea-Scented Pumpkin Soup - Now this is one soup that I'm really excited to make this fall. Pumpkin (and butternut squash) are definitely favorites of mine and the addition of Ceylon tea is a nice change of pace to those standard classic recipes. 5. Barley, Tofu, Pumpkin and Green Tea Soup - Another variation of a pumpkin soup, except this time with the hearty goodness of tofu and barley. Created by Peter Gordon, this chunky soup also includes leeks, red onions and green tea -that Gordon says is a "culinary feast." 6. Green-Tea Infused Cantaloupe Soup - In the post one cantaloupe, three soups, I made a green tea cantaloupe soup and was shocked by how much I loved how it came out: a little earthy and naturally sweet. It was also very quick to prepare and used minimal ingredients -- cantaloupe, water, honey, lemon, apricots -- that can be easily modified to use another blend of tea like chamomile, pomegranate, white tea, etc. Well, now that's a mouthful of a title and a completely different soup than I intended to make this week but, as it turns out, one that was delicious and super easy to make. Originally, I was going to make Manhattan Clam Chowder (which I still plan to do) but after getting caught in a storm, actually a hurricane, and subsequently getting drenched the only thing (other than getting dry) that I wanted to do was to go home and have a nice comforting bowl of soup. Since I was far from a store that sold fresh clams, I decided to use the fresh tomatoes that I purchased earlier in the day -- a mix of yellow and beefsteak ones -- along with some carrots to create a tomato basil and carrot soup. I opted to use carrots instead of creating a traditional tomato basil soup because it was a seemed a little too similar to the tomato basil fish soup and the tomato pesto soup that I made a few weeks ago. For this soup, I decided to make it a little chunkier -- nothing like a chunky after the rain -- which can be modified if you want a smooth soupy. The gnocchi part came into play because I had some leftovers at home, which made the soup nice and filling. Hope you enjoy this one, this sweet and savory soup definitely made my day a lot better. For the most part, kids are picky eaters. No matter how much you try or how finely you chop those veggies; kids have a way of spotting out the green and pushing it aside in disgust or in the form of a fit. As a mom to a two-and-half year old, I've tried to present veggies as they are, then we that didn't work I tried to sneak them into anything I could -- pasta, smoothies, and even mostly recently in a spinach cake. Some were successful attempts, others not as much. 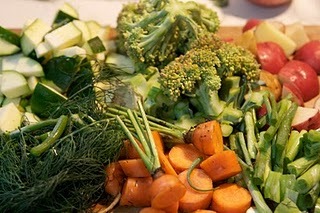 One successful method (at least 90% of the time) has been the inclusion of vegetables into soups. I've scoured the web for some of the best recipes for kids (as well as supplied some of my own) -- for their versatility, ease of preparation, tastiness, and of course ease with which your child will eat them. Of course, these are general ideas, so please feel free to share your own soup secrets. 1. 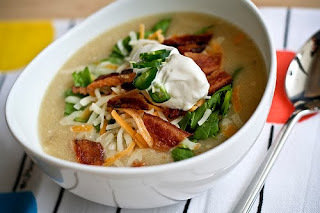 Loaded Baked Potato Soup - Potatoes are generally a go to food for kids, and with its high concentration of Vitamin C, cooper and fiber parents should be serving them quite often. This soup recipe by Bitchin' Camero is touted as a soup for the sports season, but I also think a filling recipe like this would be ideal for kids. Not only does the soup include potatoes but it is 'loaded' with bacon, cheddar cheese, yogurt and spinach. Camero also lists some great suggestions for toppings -- broccoli, salsa, tomatoes, mushrooms to a name a few choices. 2. Pea Soup - Dubbed as a "kids' favorite," this soup recipe includes carrots, potatoes, broth, celery and ham that is an exciting soup for youngsters and their parents. Also, check out this Spicy Black Eyed-Pea Soup by Seitanic Vegan Heathen (great name!) for a vegan variation on this classic recipe. 3. Kid's Soup - Simple title, but this soup is vegetable powerhouse that includes all the good stuff that kids need as well as the pasta that they love. 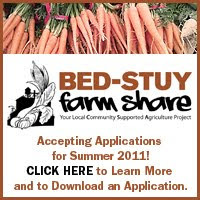 I love how it includes zucchini, cauliflower, carrots, tomatoes, corn and peas. I might add some fresh basil or sage to enhance the flavors. 4. 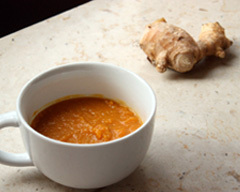 Carrot Ginger Soup - Another veggie that some kids don't have a problem eating is carrots. This sweet vegetable is packed with Vitamin C that thanks to the addition of ginger and curry that will boost the flavor. 5. Spinach and Corn Soup - I've found that spinach can be a difficult food to get my tot to eat (and I'm pretty sure I'm not alone on that one). However, this soup and its combination of sweet corn, cream and herbs dulled down the ever-so-scary green color that was enjoyed by kids under three and even by dads that are over 30. 6. Sweet Potato and Cranberry Soup - I made this soup over the holiday's, but this healthy sweet potato soup is a great treat for your kids year round. Dubbed as a "super food," sweet potatoes are packed with beta cartone and Vitamins A and C. The addition of cranberries (if your kid will eat them) supplies an additional boost of antioxidants and fiber. 7. Black-Eyed Peas and Mixed Veggie Soup - This was a big hit in the Soupy household that I made during the start of the new year. I was shocked as my toddler not only devoured the beans but ate the kale with gusto. The simple seasonings - garlic, celery salt, salt and pepper -- along with leeks and beets made for a healthy and very filling soup. If your child is picky about the kale, omit it -- the black-eyed peas alone will make for a filling and very fiber-rich soup. 8. Cauliflower Soup with Tandoori Yogurt - Cauliflower doesn't have be boring anymore thanks to this brilliant recipe by Deb of Kahakai Kitchen. Originally from the Canyon Ranch Healthy Living Club, this thick and creamy soup is packed with seasonings (cumin, garlic, ginger, etc), leeks, carrots and cauliflower for a healthy and tasty soup for kids of all ages. 9. Simple Soups for a (Silly) Toddler - Yes, they sure are silly and keeping things simple is definitely the name of the game. I really enjoyed reading this recipe by Scatter the Batter that includes several variations of a chicken/vegetable soup. Scatter suggests starting with a pressure cooker and adding a heaping of veggies (carrots, tomatoes, onions, pumpkin or peas), along with some spices (ginger, garlic, cinnamon, etc). This is a great base to get you started in your soup making since every child is different whose tastes and preferences need to be varied. 10. 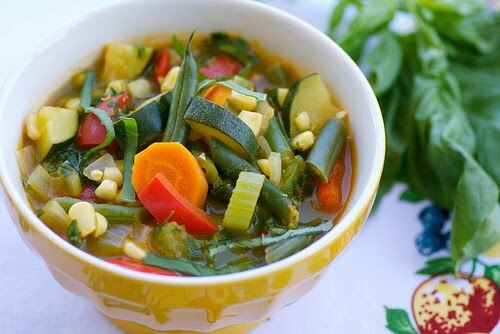 Vegetable Soup - But maybe instead of sneaking veggies, it's better to introduce them early on in their natural form. This vegetable soup by Green Lite Bites is certainly a good way to start. Packed with leeks, green beans, carrots, beans and fresh herbs, the author noted that this recipe is her son's new favorite and one that I can't wait to try myself. Mac and Cheese Soup - Pasta + cheese in a soup! What's not to love? Butternut Squash and Carrot soup - A classic sweet and hearty soup, great for the fall. Also, check out Jessica Hulett's Acorn Squash Soup recipe with the tasty addition of coconut milk, ginger root and cayenne pepper. Chicken and Wild Rice Soup - A classic chicken soup by What's for Supper Sister, except this one that includes wild rice, almonds, carrots, celery and onions. If it's too rich for you and your little ones, omit the cream and butter. Cream of Broccoli Soup - If they can get past the green, this soup is sure to please: creamy, rich and delicious. 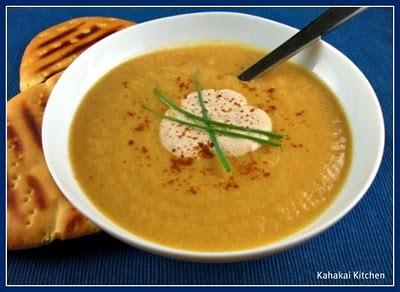 Lentil Soup - Another classic, this soup recipe also includes sweet potatoes, spinach, carrots and some peanut butter. Note: Some of these recipes include spices and ingredients that a lot of kids won't try -- despite how blended together or disguised a recipe is. If your child is picky, start slow - maybe by using salt and pepper - to gradually building up their taste buds. 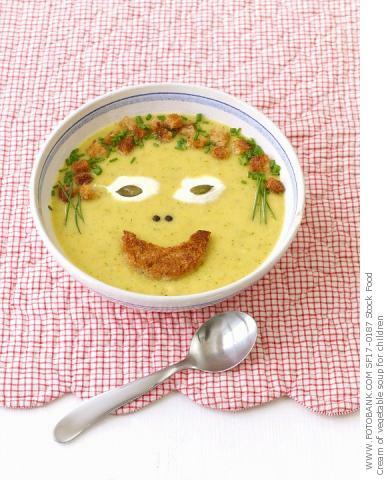 What soups do you make for your kids? I was almost certain that this creamy broccoli soup has been on Seriously Soupy before -- but after some digging into the archives I only found it in this post -- 10 Super Soups for the Superbowl -- and not as an original recipe. I was excited to try (and eat) this comforting soup and everything about it was pretty simple to make: chop onions, garlic and broccoli and add basil and cream, cook and blend. 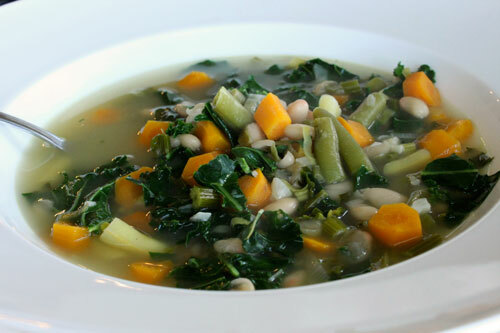 But, what was amazing was the rich and creamy texture that can be modified to include parsnips, mushrooms, spinach, etc -- any extra veggies would be a perfect match for this rich soup. Enjoy! Everything about trying this recipe was out of my comfort zone. I have had this type of soup 100s of times but I never thought to make it myself, most likely, because I figured the wonton itself would be too challenging. But since this blog is about soups, I really want to try everything and decided to delve head first into attempting my first wonton soup. I researched some wonton recipes -- and really loved Rasa Malaysia and The Voice of Joyce, but I decided to modify them a bit and make a vegetable wonton soup. I visited an Asian market in Sunset Park (Hong Kong Supermarket) and I stocked up on sesame oil, chili oil, wonton wrappers (Shanghai and Hong Kong style) and various vegetables (mushrooms, bok choy and bamboo shoots). The soup part was a cinch and it actually took a lot less time than I thought it would to prepare (a majority of which involved chopping the veggies). My wonton's, though, proved a little difficult when shaping them and finding the right balance of ingredients to use so that they didn't break apart in the water. Through some fumbling, I created a scrunched-looking wonton - maybe not the prettiest doughy-treat but one that proved pretty resilient since none of them broke apart! I look forward to trying this once again; as I continuously attempt to perfect my wonton-making skills. This week I wanted to make a corn chowder, but instead of using potatoes and bacon, I decided to use a butternut squash I had lying around. Hardly a traditional chowder, I really wanted to experiment with a less watery soup and one whose ingredients weren't all blended together (there as been a lot of that lately). I read about a salmon chowder in "The Soup Bible" and I liked the idea of a creamy fish soup. I decided to use carrots, corn, tons of dill and of course butternut squash. Thanks to the fresh dill, scallions and onion, I found that the recipe didn't need that much seasonings -- only some salt and pepper -- that resulted in a sweet soup that became another favorite of mine. It was also nice to test out butternut squash in a different recipe other than as an ingredient in my all-time favorite soup -- puree of butternut squash. I hope you enjoy this one; it definitely a great hearty meal-like soup for those cooler days ahead. Not only is it good old T.G.I.F but it's time to roundup the best soup links from the great big blog-o-sphere. I was excited to discover so many veggie-based soups, which is a delicious way to get three or four or even 10 vegetables in one serving that doesn't feel as if you eating your vegetables -- if you know what I mean. A roasted pepper, minestrone and a summer soup packed with vegetables are some recipes definitely worth checking out this weekend. Late Summer Vegetable Soup with Fresh Basil - Created by Susan of Food Blogga, this summer soup is a power packed medley of veggies (see pic). From corn to zucchini to carrots and bell peppers, this colorful soup makes it really easy to get a hearty dose of essential vitamins and minerals that is also pretty easy to make. On top of all of that veggie goodness, the soup is enhanced with a tasty, yet simple basil pesto that, I'm sure, would be amazing all on its own. Roasted Yellow Pepper and Summer Tomato Soup with Serrano Cream - Me and Dishin' in the Kitchen had similar soup ideas this week as we both created a pepper and tomato soup. 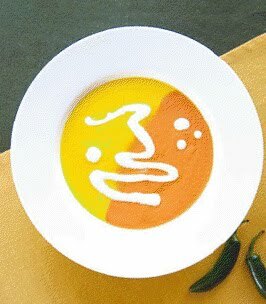 This two-toned soup recipe, adopted by Cindy Epstein from Parade magazine, included yellow bell peppers peppers, plum tomatoes, sherry, butter, heavy cream and white among many other tasty choices. She stated that they could be served hot or cold, however, she goes on to say that "the preparation is lengthy." I really enjoyed this post and especially the step-by-step instructions of the entire soup process from the roasting to how to make the serrano cream. 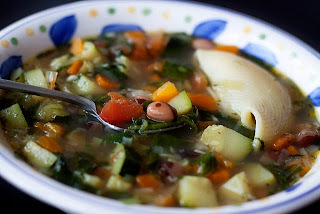 Summer Minestrone Soup - As the temps are inevitably dropping, it's time to start thinking about hearty soups like this one on Behind the Skillet. This minestrone recipe -- adapted from Alice Waters -- is packed with summer vegetables like carrots, spinach, tomatoes, onions, zucchini, leeks as well as a hearty dose of beans and pasta for the perfect meal-like soup.The post also includes lovely pictures of the whole soup making experience that secretly has me longing for days when soup like this can be enjoyed every day. What are your favorite vegetable soups?